All orders ship from California. USALight.com offers free shipping on all orders over $100.00 for the lower 48 States. For expedited freight including Next Day Air, 2nd Day Air, or 3 Day Select, USALight.com calculates shipping costs at the time of purchase and determines the cost by package weight and destination. We pass the UPS published rate for shipping along to our customers. We do not charge a handling fee. Larger, heavier items require additional attention and may be shipped separately. All orders placed on our website ship via UPS. Larger orders may ship via LTL truck freight. No other shipping methods are available. Smaller orders may ship via UPS SurePost®. SurePost service combines the consistency and reliability of the UPS Ground network with final delivery typically provided by the United States Postal Service. Please note that orders shipped to Hawaii and Alaska will incur additional shipping charges. Free shipping is not available to Alaska, Hawaii, or for International Customers. If you wish to cancel your order, call our Customer Service Department during normal business hours at 1-877-235-0020. Your order will typically be delivered in 5 to 7 business days. In the case of a back order, we will notify you within 5 business days. Contact customer service on all time sensitive schedules to verify inventory levels. Please note that all orders are processed Monday through Friday from 7:00AM until approximately 2:45PM PST. Orders are not processed and shipped on weekends or holidays. If you have a strict deadline, you must contact customer service to ensure we can meet your project needs. USALight will not ship to P.O. Boxes. For questions about our shipping outside the continental United States call Customer Service at 1-877-235-0020. If you have after hours questions please use this contact form and a Customer Service Representative will contact you within 24 hours. USALight.com is dedicated to delivering the best service to our customers. We strive to deliver your order correct the first time, and damage free. If you have issues with your order, you can be assured we will resolve it beyond your expectations. USALight allows seven (7) days to inspect your order to ensure items arrived correctly, and damage free. If you received incorrect items, or damage in shipment, call us immediately at 1-877-235-0020 to arrange replacement items at no charge to you. If you are not satisfied with your purchase within 45 days of delivery date, you may exchange the item(s) or receive 100% store credit. Items older than 45 days of delivery date may not be returned. Returns for refund will be subject to 20% restocking fee, or a customer may accept a 100% store credit. The 20% restocking fee applies to all refunds if the customer declines a store credit. Shipping costs are non-refundable. Below are the requirements for a refund. 1. Items must be in new, never installed condition. 2. Free of scratches and evidence of installation. 3. Items must be packaged in original individual packaging. 4. Items must include all accessories. 5. Custom and or special items are not returnable nor refundable. Please contact customer service at 1-877-235-0020 to request a Return Merchandise Authorization (RMA) code. All returns must be approved in advance and returned with shipping prepaid in original condition, in their original packaging and must be in new condition. Installation of products which cause damage voids any return and credit. USALight.com will inspect all returns to determine the condition of returned products. Final decision of credit worthiness will be determined after inspection. No returns will be accepted or credited without a Return Merchandise Authorization number (RMA Number) issued to you from our customer service department in advance. USALight.com takes customer service very seriously. USALight.com warranties all our products for 1 year for the original purchaser. Any manufacturer warranty that exceeds USALight.com's standard 1-Year Warranty can be resolved with that particular manufacturer by the purchaser. The warranty policy at USALight.com is designed to ensure our customers' confidence. Please take a moment to review our policies below. Many products offered by USALight.com provide a manufacturer's warranty. Manufacturer warranty contact information is included with these products. USALight.com takes great care in packing and shipping items to avoid transit-related damage. However, in the case that an item is received damaged, claims must be made within two working days of the damage. As the shipper, we will file the claim on the customer's behalf and arrange for replacement at no charge and no shipping, or arrange for refund. The package must be received (not refused under any circumstances) and inspected. Replacement and refund will be assessed according to the amount of the actual damage. According to U.S. law, refund credits can only be returned back to the card of original purchase. In the event that a card can no longer be charged back (lost card etc.) an attempt on our part has to be made at least once and then a company check will be sent to the purchaser. Compatibility with low-voltage transformers can be an issue with LED MR16 replacement lamps. Transformers generally require a minimum connected load for proper operation of the connected lamps. Compared to the halogen MR16 lamps that they replace, LED versions draw significantly less power (e.g., 3 W vs. 20 W) and may not provide sufficient load to the transformer. Consequently, LED MR16 replacement lamps may not work or may flicker, strobe, or randomly shut down in an existing low-voltage lighting system. Similarly, existing dimmers, relays, and related-controls typically have minimum load requirements and may not operate properly with some LED replacement lamps. Please consult a professional before using LED light bulbs in low voltage fixtures, as this combination will void your USALight.com warranty. USALight.com takes our customers' security seriously and our site is very secure. USALight.com uses industry standard security standards. During the ordering process, if making a payment by credit card, the area in which the payment is made is a secured area of our web site. In this secure area, personal information will be encrypted and processed by an official employee of USALight.com. Personal information can also be submitted over the phone. To contact a customer service representative, call 1-877-235-0020. Transactions are Authorize.net and McAfee secured. All products with written or expressed warranties will be gladly satisfied, replaced or credited within the warranty time limit. If you wish to cancel your order, call our Customer Service Department during normal business hours. Unless the order is for a specialty item or the product has already shipped, your order will be cancelled without penalty. If your order is for a specialty item, we will have to verify with the manufacturer that the order can be cancelled. You would be responsible for any restock fees charged by that manufacturer as well as returning the shipment. There will be a restocking fee and no reimbursement for the original S&H charge. 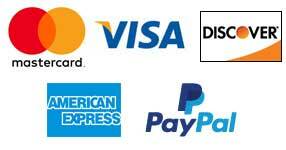 What methods of payment does USALight.com accept? How fast can USALight.com deliver my order? Provided that the product is in inventory your order will typically be delivered in 5 to 7 business days. If you need an order immediately, we recommend calling Customer Service to ensure the products are in stock and can be shipped right away. USALight.com maintains 70% of our inventory on a 90 day stock level for excellent service to the client. We ship from Southern California. USALight.com employs professional packers and shipping technicians who are experienced in fragile shipping. With all the precautions taken by our staff to ship our products securely it is rare that an order is lost or damaged. In the instance that loss or damage does occur, our Customer Service Department will correct matters to your satisfaction. Will USALight.com sell my name and address to other companies? No. Any information provided is used by USALight.com only to serve our customers in the best and most efficient way. Your security is important to us and we do not sell our mailing list to anyone. Can I order items that are not found on USALight.com? Definitely! If there is a lighting product you have found on another website or in a catalog or store, we will be happy to get it for you. Please send an email or call our Customer Service Department with your product request. Do you accept returns on ballasts? In some cases, USALight.com inspects and tests ballasts for quality of construction. If these ballasts prove to be superior, we will provide a warranty that exceeds the manufacturer warranty. Yes, USALight.com reserves the right to substitute comparable brands if necessary.